Claire is one of Canada’s dedicated and experienced ShelterBox Response Team (SRT) members. 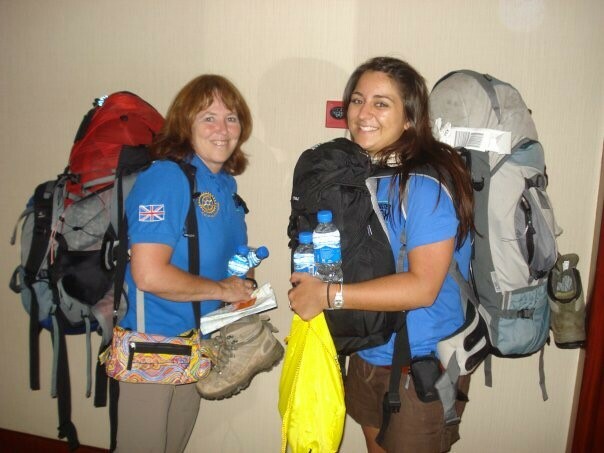 Since becoming an SRT in 2007, Claire has been around the world to help get aid to families who need it most. Claire’s first deployment was to China in 2008 and Lizzy Treglawn was also on her first deployment. Lizzy was the youngest SRT at the time at 19 years old. In 2010, Claire was deployed to Indonesia in the wake of Mentawai tsunami. Then in 2011, she responded to a cyclone in the Philippines where the work was often coordinated by female Rotarians. Claire has also been to Malawi after severe flooding. In Malawi it is the women in their culture who manage most aspects of home life including rebuilding, so most of our distributions were to female heads of households. Then, most recently, in 2017 Claire was deployed to Bangladesh to help with severe flooding, where she said it was “a humbling experience”. Speaking of her most recent trip to Bangladesh, Claire said the hardest part is returning home and seeing our relative wealth compared to the people they are helping around the world. Claire worked with other response team members in Bangladesh coordinating our response to provide 4000 families with shelter and supplies, the majority of whom were women and children. Without passionate volunteers like Claire, ShelterBox could not go to the most remote corners of the world to deliver life-saving aid. We are truly grateful for everything she does. Claire (left) with Lizzy getting ready for for their deployment to China.